Sunflowers in Italy: an Aussie's memories. We had just stepped off the little shuttle boat that had ferried us across from the Island of Murano. We actually had stepped onto the wrong boat and now we found ourselves 'somewhere' we should not have been! However this opened up another avenue for more adventure - now to find our way back to the hotel! 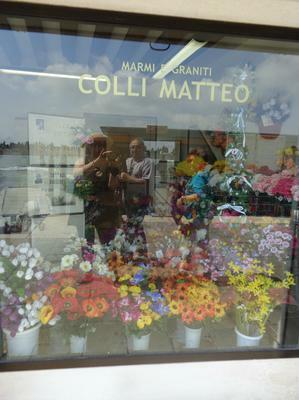 This was the first scene I was presented with, a little florist overlooking the bright blue ocean. There in the foreground I captured some beautiful examples of the various colors of sunflowers. How pretty. I had totally forgotten that photo and I thank you for prompting me to look through my Italy Holiday pictures - oh, the memories! Sometimes, as you say Marylyn, ending up somewhere unexpected can bring the most memorable parts of a holiday. It's not hard to get lost in Venice but actually, it's one of the nicest ways to see the place. Murano and Burano are both beautiful islands. I think Burano is my absolute favourite, although it's hard to choose. Thank you for sharing both your pic and your memories, Marylyn. Come back to Italy soon! Join in and write your own page! It's easy to do. How? Simply click here to return to Let's See Your Sunflowers!. Captured this photo on our way from Venice during that amazing holiday to Italy in June, 2014. 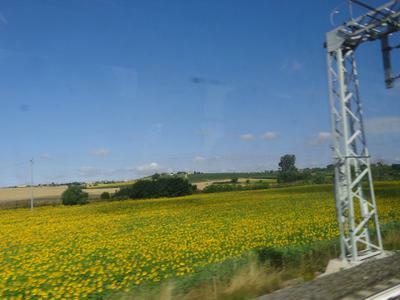 We were riding on the fast train back to Rome and I was thrilled to see fields and fields of sunflowers either side of the train! Travelling at 248km/hr! Thank you so much for sharing these pics with us. It just goes to show - there are sunflowers more or less wherever you look in Italy! 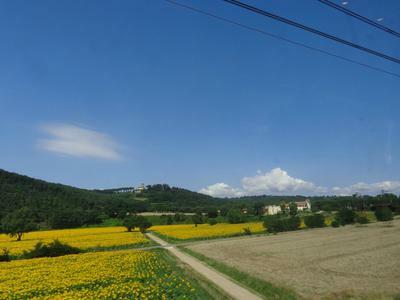 We have a page about travelling by train in Italy - click on this link to take a look. Thanks again for sharing. Love these! Sunflowers in Florence! Yes, I found some at the indoor Mercato Centrale` market! 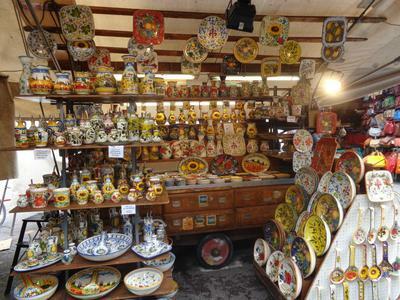 We had been wandering the streets of Florence as you do when playing tourist and we found the market place. A perfect place to sit and watch the locals and tourists wander by. An amazing place to explore local cuisine and chat with the friendly stall holders. 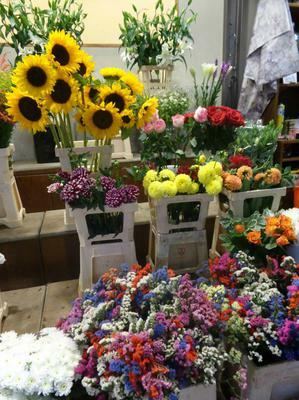 The fresh flower stalls are beautiful, I only wish I had captured more impressive photos at the time. Still I can always go back and take some more next time! Florence market - what a wonderful place! Marylyn, thank you so much for the pic. You have captured the moment exactly! Those colours are beautiful. The indoor market in Florence is one of my very favourite places to go. The smells, and the colours! It's an experience just wandering round and, you're right, watching the world go by whilst sipping a nice cup of cappuccino, or a cold glass of Prosecco! "A doppo" - till next time! Found this amazing market stall in the streets of Florence. I captured the image at the San Lorenzo outdoor market, a bustling market filled with all sorts of leather, china, souvenir and clothing stalls. Loved the vibrant color of the china and lo and behold, look, lots of sunflowers!